Learn how to trade Bitcoin profitably and safely, with professional day trader and trading coach Harvey Walsh. The price of bitcoin soared more than 1,300% in 2017. Not a bad return for anyone who bought at the start of the year, but savvy traders made considerably more. By trading price movements in both directions, those in the know were able to make huge profits, and now Harvey Walsh is going to pull back the curtain and show you how you can do the same. Exactly what Bitcoin is, and how it works. Both conventional and unconventional ways of trading cryptocurrencies like Bitcoin. Why Bitcoin arbitrage is harder than you think. How to use multiple exchanges to unearth hidden trade opportunities. A little-known virtually risk-free and zero-effort method to profit from Bitcoin and other cryptocurrencies. How to easily set yourself up as your own Bitcoin exchange to profit from the spread. The hidden traps that lurk in every corner of the Bitcoin world, and how to steer well clear of them. All the tools you need to get started, where to find the best ones (for free), and how to use them to get ahead of the other traders in the market. How to spend your Bitcoin trading profits at the world’s biggest store, and get a discount into the bargain. Bitcoin has often been referred to as the ‘Wild West’ of finance, and with good reason. There are more ways to lose money with Bitcoin than any other kind of trading, and no shortage of scammers and hackers eager to get their hands on your profits. So as well as showing you how to trade these exciting new markets for maximum returns, Harvey also teaches you how to stay safe. Written in his well-known chatty style, Bitcoin For Traders avoids unnecessary technical jargon and buzzwords, making it fun and simple to learn. Bitcoin doesn’t have to be complicated. If you already trade, this book will help you make the transition in no time at all. 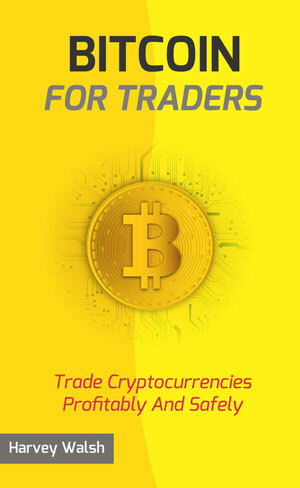 And if you’ve never traded before, two detailed appendices will get you up to speed with the basics, and present you with proven and profitable strategies you can use to begin trading today.